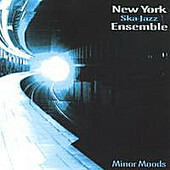 New York Ska-Jazz Ensemble ("NYSJE") started around ten years ago and, even though most of the original members are no longer with them (except Freddie Reiter), they continues to pound out great, jazzy ska tunes. Minor Moods is another indication of why the NYSJE is in a class all by themselves. The New York Ska-Jazz Ensemble can appeal to younger and older fans alike, as well as jazz and ska fans, demographics that nary a band these days can hit with one sound. Listening to them is like a breathe of fresh air. In a genre where the trend is to play more upbeat songs, the NYSJE continues to do what they do best: slow riffs, smooth horns, and fantastic melodies. Included on this album is a remake of the Toasters song, "Mouse", and a live version of "Buttah", which was on their previous record, Get This. The NYSJE are the Skatalites of the Third Wave, and that is the best compliment you can receive in the ska genre. This CD is highly recommended.